Cup Characteristics: Full flavored and pungent with a rich fruity character. Add a cinnamon stick or a few cloves for an exotic mulled spiced tea. Herb and fruit tea in some circles is considered a new type of tea. We formulated this blend to accommodate tastes of people who wanted to experience a refreshing healthy new style drink without caffeine. What we got was a terrific ‘tea’ that is unbelievably delicious and enjoyed Hot or Cold! This tea has a very exotic flavor profile. 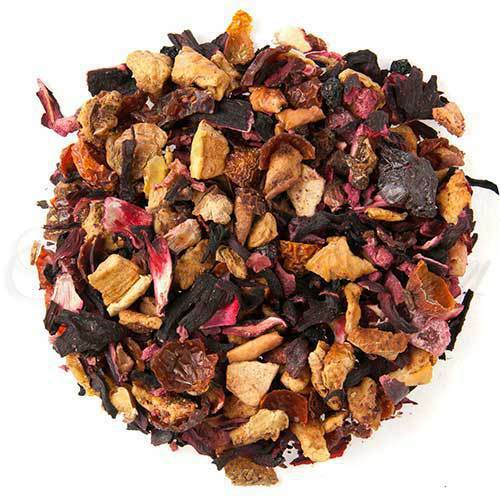 The delicious blend of cranberry, fruit and apple flavors combined with the natural flavors and tartness of the various dried fruits create a summertime cooler or a wintertime summer reminder. If you are a skier or enjoy evenings in a rustic cabin around a roaring fireplace, put a pot of this tea on. After it has brewed pour into 3 quart cooking pot, add a bottle of deep full flavored red wine, a couple slices of orange and a stick of cinnamon, about 10 cloves – simmer for 15 minutes – add sugar to taste – now you have the perfect gluwien – Incredible! For a summer time drink Cranberry Apple iced is hard to beat. It is refreshing and thirst quenching and not overly sweet. For formal times garnish the glass with a slice of orange and a stick of cinnamon – for non-formal times pour it into your glass and enjoy it gulp after gulp! If you have small children use the Cranberry Apple tea to make popsicles – they taste great and contain very little sugar.